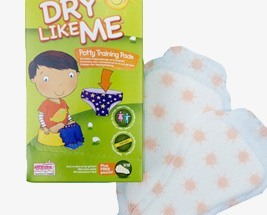 Disposable Pads are designed to sit in the regular underwear of a child, capturing small accidents or leaks. They help children recognise when they need to go to the toilet and so make a perfect item to help with potty training. The pads can be used by children of any age and can be worn at the front, back or both to help capture urine and feces making for a less stressful time when being worn.